Re: painting over old wallpaper – DON’T DO IT! 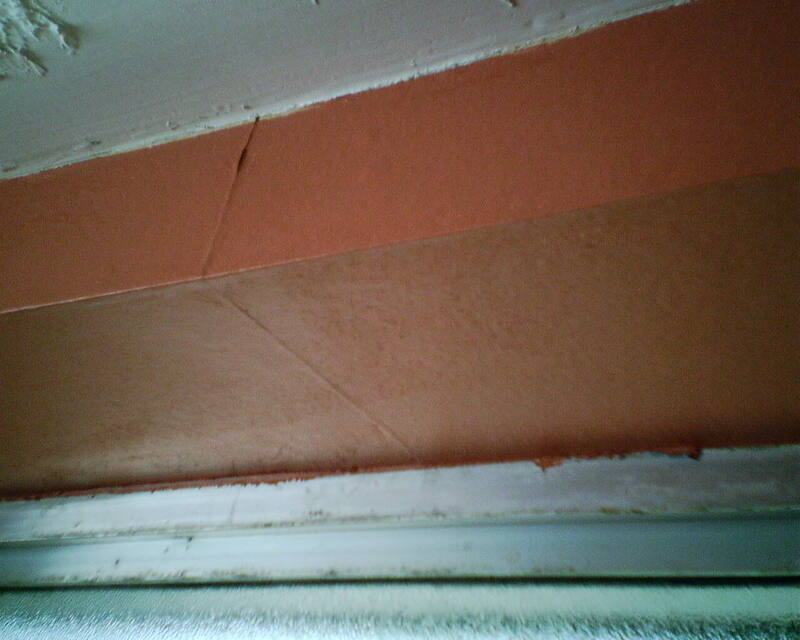 See photo at left, of a short fur-down over a window, where the vinyl top layer of paper was stripped off, and the paper backing was painted with latex wall paint. In the second photo, I don’t think they stripped off anything. They just painted over the old paper. Even the thick texture could not prevent the paper’s seams from popping, nor hide them when it happened. As you can see, the original wallpaper is letting go of the wall (probably due to fluctuating humidity levels in the room (a potty / shower room used by teenagers), as well as torque (stress) put on the seam as a result of the latex paint on top of the paper adding moisture (swelling) and then drying (shrinking), and then other factors over time, such as humidity, paper backing, moisture, poor quality paper, humidity, improperly prepped walls, moisture, poor quality wallpaper … Oh, did I mention HUMIDITY and POORLY PREPPED WALLS and POOR QUALITY PAINT? Get the humidity under control, prep the walls properly (read more on this blog), and choose a good paint. 1. The seams will show, and it will look awful. Even if you THINK the seams are flat and you cannot see them now, they will show when there is a layer of paint on the paper. 2. The water in the latex paint will cause the wallpaper to lift and bubble. 3. Wallpaper has a plastic coating, and paint won’t stick to it. It will SORT OF stick, then at some point, or with minor stress on a particular area, it will begin to peel off. 4. Paint on top of wallpaper makes it VERY difficult to take off later, if not impossible. 5. It builds up layers of thickness on your wall, each one having a potential to pull away at some point. 6. It just looks cheesy, even from a distance. If I haven’t convinced you that it’s a bad idea, of if you simply have no alternative, here are some tips that will help make the project a success. 1. Be sure it’s paper and not vinyl, as paint won’t stick as well to vinyl. Even so, it is possible to paint over vinyl – it just looks worse. 2. You will have to “float” over the seams with drywall joint compound, to hide them under the new paint. In the first photo at left, the vertical seams have been floated, as have the horizontal ridges where the border overlaps the wall paper. 3. Sand smooth, wipe off dust with a damp sponge, and prime with OIL-BASED KILZ, or shellac. This oil based primer is important, to form a barrier which the latex paint can’t penetrate, or it will cause the underlying paper to bubble. Some of my paperhanger buddies swear by GARDZ. In the second photo, the priming process has begun. 4. Texture the entire space, either with spray-on or roll-on. This is important, because the floated areas will absorb the paint differently from the unfloated areas, so you will end up with vertical stripes throughout the entire room. Texturing creates an even surface so the paint is not blotchy. 5. Paint with two coats. The first soaks into the texture and is not true to color. The second coat will be the right color. You could possibly KILZ the paper first, to seal it, then use a heavy texture over that, hoping it will hide the seams. Then paint.